UPDATED: Sat., March 31, 2018, 6:19 p.m.
SEATTLE – As a defensive back for Pete Carroll’s USC teams from 2005-09, Will Harris was in the middle of one of the greatest runs in Pac-12 Conference history. Over a four-year period, those Trojans teams went 35-6 and appeared in four consecutive Rose Bowls. So, yes, Harris has some familiarity with talent. 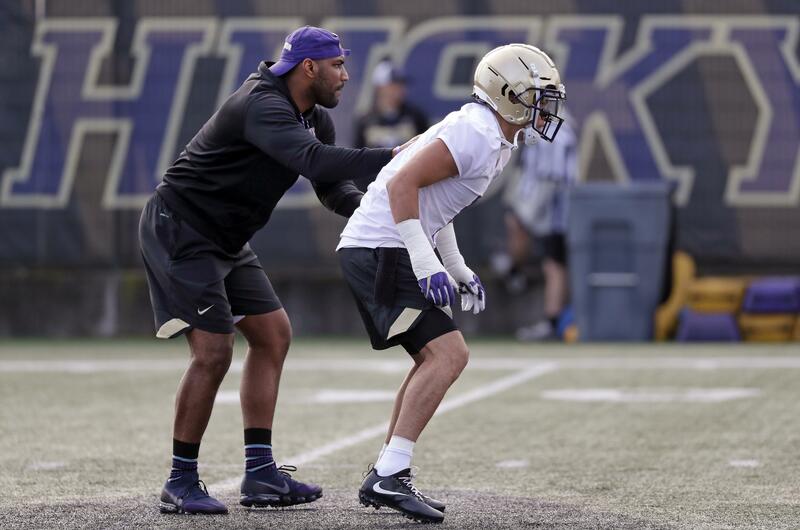 As the Washington Huskies’ new assistant defensive backs coach, Harris on Friday wrapped up his second spring practice on Montlake. Two practices in, he is not ready to make any grand comparisons of this Washington defense to those of his USC era, but he is impressed with the veteran secondary with which he’s working. The Huskies return 10 scholarship defensive backs, including all five starters, from the Pac-12’s top-ranked defense. After USC, Harris spent some time in Seahawks camp, then a season playing in the Canadian Football League. In 2013, he got his first college coaching job at Northwestern Oklahoma State (in Alva). From there, he moved to Humboldt State (Arcata, California), then Dixie State College (St. George, Utah), before spending the past two seasons as the defensive backs coach at San Jose State. It was while he was at San Jose State that he first met UW defensive coordinator Jimmy Lake when they worked together at a high school summer camp. Immediately, Harris said he felt a “fluent vibe” with Lake. In January, when new NCAA legislation allowed FBS programs to add a 10th assistant coach, Harris, 31, was hired to work alongside Lake in the defensive secondary. Harris, who attended Charter Oak High in Covina, California, will be responsible for recruiting the Los Angeles and Dallas areas for the Huskies. Asked about Seattle’s two “Coach Petes” – Petersen and Carroll – Harris said there are similarities with how they run a team, particularly with the level of competition in practices. Published: March 31, 2018, 5:17 p.m. Updated: March 31, 2018, 6:19 p.m.